This book is seperated in 2 volumes. This study searches for similarities in adult and child language systems in the domains of tense, modality and aspect (TMA). It takes its starting point in Functional Grammar, in which grammatical TMA expressions are classified according to their scope. Wider scope correlates with an increase in cognitive complexity and a decrease in communicative motivation. This leads to the expectation that TMA expressions with wider scope behave differently from expressions with narrower scope both in adult and in child language. Several studies are conducted. A detailed analysis of TMA expressions in English serves to find out if their scope plays a role in synchrony and diachrony. A typological study is carried out to answer the question how scope differences are reflected in diachronic developments, synchronic configurations, frequency, and morphosyntactic properties of TMA expressions. The acquisition order of TMA morphemes is examined in detail for English and more generally for 24 other languages. Here the acquisition order of TMA expressions with different scopes, and the crosslinguistic similarities in the acquisition of TMA expressions are studied. The study provides new theoretical insights in TMA. It reveals remarkable similarities in the development of TMA expressions in diachrony, synchrony and first language acquisition that provide a strong argument for more interdisciplinary research on language and language use. 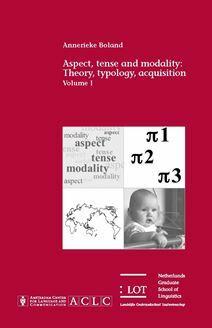 The book is of interest to typologists, psycholinguists and those interested in functional models of language.